In case you felt you didn’t have enough sale items to choose from with the Online Extravaganza happening, here are the new Weekly Deals! Wow – talk about just what you need for your Christmas and holiday cards! 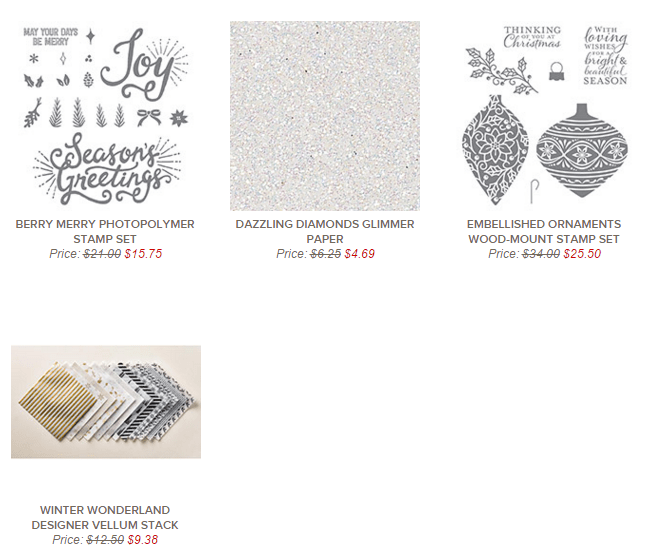 The Dazzling Diamonds Glimmer Paper and Winter Wonderland Designer Vellum Stack add such a WOW factor to all your cards and projects – which you can make using the on sale Berry Merry or Embellished Ornaments stamp sets! Remember that you can add your orders from the Annual and Holiday catalogue together with the Online Extravaganza deals, the Weekly Deals, plus anything from the Clearance Rack – one order, and you’re done! If you’d like me to place your order for you, please contact me either by phone or email (debsmart@shaw.ca 604.298.0472). If you’d like to order online, just click my signature below, and you’ll be taken directly to my online store – a secure site. (did you know that you can tell if a site meets online security protocol by looking at it’s URL – if it starts with ‘https’ – the ‘s’ means secure! I always look for that, if I’m ordering online). Okay – I’ll be back later this evening with another card for the Paper Craft Crew – I hope you’ll join me then! In the meantime, if you’re on Facebook, I’m participating in an online shopping event with about 8 other vendors – we’re all local in the lower mainland of B.C., but you can shop online at any of our sites, and have your order direct shipped anywhere within Canada. If you’d like to have a look, click HERE ; there’s a new prize awarded daily, and lots of variety! Previous Previous post: IT ALL STARTS NOW – ONLINE EXTRAVAGANZA!